Preheat oven to 350 degrees. Spray 8 cups of a 12-cup muffin pan with nonstick spray. Press wonton wrappers into the 8 cups of the muffin pan. Lightly spray with nonstick spray. Bake until lightly browned, about 8 minutes. Meanwhile, prepare bacon according to package directions, either in the microwave or in a skillet sprayed with nonstick spray. Once cool enough to handle, crumble or chop. In a small bowl, mix cheese wedge with cream cheese until smooth and uniform. Bring a skillet sprayed with nonstick spray to medium heat. Cook and stir mushrooms for 2 minutes. Add egg, scallions, salt, and cheese mixture to the skillet. Cook and scramble until fully cooked, about 4 minutes. Remove from heat, and stir in bacon. 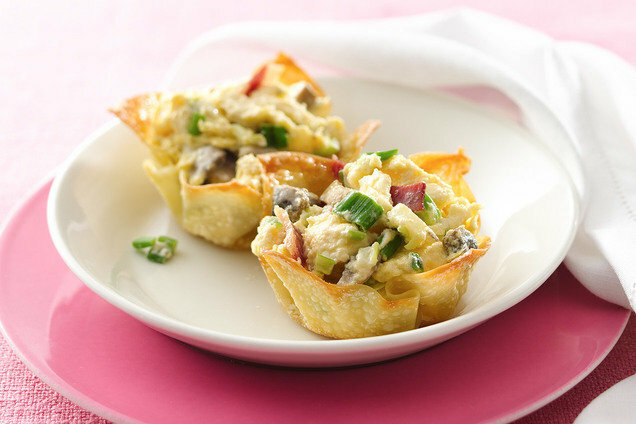 Just before serving, evenly distribute mixture among the wonton cups. 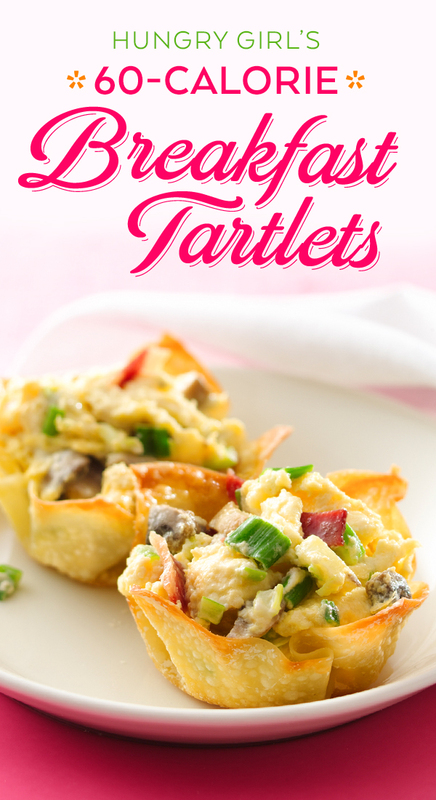 HG Tip: If you're not eating/serving these immediately, store the baked wonton cups at room temperature in a sealed bag or container, and store the filling in a sealed container in the fridge. HG FYI: A previous version of this recipe appears on the website and in Hungry Girl 200 Under 200, but we’ve given it a 2018 update! Nutritional info varies. Stop everything and check out this incredible bakeware package over on Amazon. You get a standard 12-cup muffin pan (perfect for today’s recipe) AND a 24-cup mini muffin pan (ideal for the poppers below), both made of nonstick, easy-to-clean, 100% BPA-free silicone. BOTH for under $25? Good stuff! Hungry for More Healthy Brunch Recipes? Preheat the oven! We hope you love today’s content as much as we do. Just so you know, we may receive compensation from some of the links. It's August 9th, a.k.a. National Rice Pudding Day. We recently sampled marshmallow treats that taste just like rice pudding... Read all about ‘em! Get the brunch party started... Click "Send to a Friend" now!